Ahhh, fall in the Lowcountry. The tourists are (mostly) gone, the heat is merely slightly oppressive, and the locals are allowed to come out and play. Or eat. Fall is well-known as festival season in these parts, with a different community event planned just about every weekend, most of them centered around our stomachs. We have fall festivals built around shrimp, seafood, oysters, burgers, barbecue, and even brunch—all with sides of booze and live music, of course. 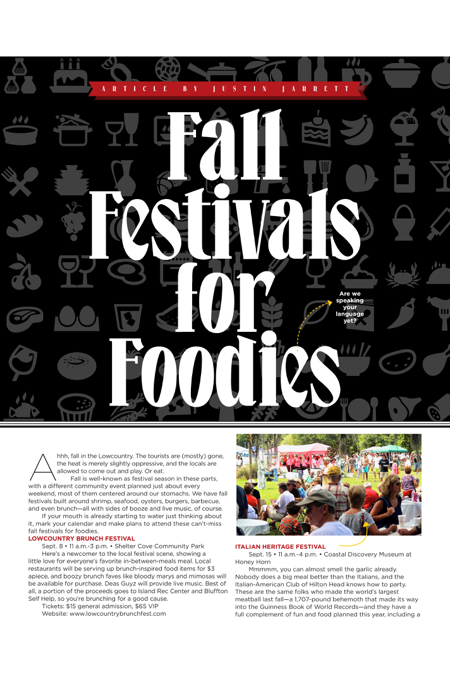 If your mouth is already starting to water just thinking about it, mark your calendar and make plans to attend these can’t-miss fall festivals for foodies. Here’s a newcomer to the local festival scene, showing a little love for everyone’s favorite in-between-meals meal. Local restaurants will be serving up brunch-inspired food items for $3 apiece, and boozy brunch faves like bloody marys and mimosas will be available for purchase. Deas Guyz will provide live music. Best of all, a portion of the proceeds goes to Island Rec Center and Bluffton Self Help, so you’re brunching for a good cause. Mmmmm, you can almost smell the garlic already. Nobody does a big meal better than the Italians, and the Italian-American Club of Hilton Head knows how to party. These are the same folks who made the world’s largest meatball last fall—a 1,707-pound behemoth that made its way into the Guinness Book of World Records—and they have a full complement of fun and food planned this year, including a pizza-eating contest and a grape stomp. If you prefer your wine pre-made and bubbly, they’ll have plenty of Prosecco, as well as Italian coffee and gelato, music, and games. A taste of the Old Country here in the Lowcountry. When you finish up at the Italian Heritage Festival, hop over to Oyster Factory Park for Blufftemberfest—a Bluffton-style (it’s a state of mind) Octoberfest Celebration on the May River. Vendors will be set up in the food court to offer all kinds of local favorites, and there will be a craft beer garden, wine bar, kids’ activities, and live music from local favorites John O’Gorman and The Pinckney Island Boys. Another newbie on the festival scene shining the spotlight on a local favorite: shrimp. This inaugural event will take place on the lawn next to the Liberty Oak in Harbour Town and feature all kinds of fun stuff, including a shrimp-tasting contest, craft beer, live music from Cranford Hollow, and a fun zone for the kids featuring face painting and bounce houses. Oh, and food galore. They had me at burger, but the bacon and barbecue sealed the deal. This “carnivorous event” marks the first year combining the popular Burgers & Brew and Beer, Bacon and Music festivals into one mega-fest that will go heavy on the meat but also feature a craft beer garden, kids’ activities, and live music on two stages. Some of the Lowcountry’s top chefs and restaurants will be serving up their best dishes, so bring your appetite. Tickets: Admission is $7 (children 10 & under are free); food/drink tickets are $1 (most food is between 2-5 tickets; beer garden mug is 5 tickets and includes one free tasting; additional tastings are two tickets; regular-sized beers start at five tickets). Bluffton residents mark the seasons by the big festivals, and this one is the event of the fall. The fourteenth annual event is a weeklong offering that showcases locally-harvested seafood, delicious Lowcountry cuisine, and the rich history, culture and art of the area. The highlight of the festival is the Streetfest, which includes a juried fine art show featuring over 100 artists from 10 different states displaying and selling their art, great music and entertainment on Oct. 20-21. The festival always brings out the best of the area’s restaurants and caterers to show off their dishes that put seafood front and center. It’s been said (often) that the Lowcountry produces the best oysters in the world, and if you don’t believe it, you better go to the Hilton Head Oyster Festival and find out for yourself. The festival highlights steamed, fried and stewed oysters along with other delicious food for non-oyster eaters (it’s okay to admit it). There will be live entertainment, a kid zone, marshmallow roasting and a sports lounge so you don’t miss the weekend’s big football games. This week-long event showcases not only the finest food in the Hostess City of the South, but also the work of an impressive lineup of celebrity chefs and a bunch of boozy events, if that floats your boat. The main event is Taste of Savannah—a celebration of food, fun, wine, spirits and more. But while most festivals only focus on eating, this one includes a series of master classes that will help put you on the other end of mouth-watering culinary creations. The name really says it all. For more than a decade, Palmetto Bluff has brought in a lineup of world-class chefs to make your taste buds sing. For the twelfth helping of the four-day festival, they’ve corralled the best and brightest of the South’s culinary minds to celebrate the South’s delectable cuisine. They’ve also rounded up a mix of vintners, brewers, distillers and mixologists from across the South and around the world, ranging from California vintners to Italian winemakers to local brewers and distillers. In addition to the tunes your tongue will be humming, an all-star lineup of musicians will provide live music to keep you dancing all weekend long. Tickets: Individual event tickets start at $75 or you can go “Whole Hog” for $1,400.